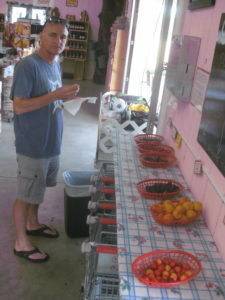 This customer is prepared for the juiciness of the apricot sample! 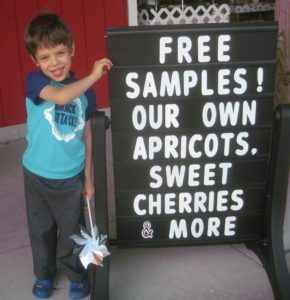 My little helper loves our free samples! If you want to educate your taste buds, visiting our market regularly is a good way to do it! We have a shelf on the wall inside the front doors which is dedicated to free samples of the fresh fruit which we grow on our farm, & sometimes with other local produce such as blueberries, which we get from other farm family friends. Currently, we have samples of our own Black Sweet Cherries (two varieties–Ulster, and Ebony Pearl), Light Sweet Cherries, Tart (Montmorency) Cherries, our earliest Apricots, and Blueberries from SW Michigan. We also have samples of pantry items at our sampling station in the middle of the market; today’s samples are Cherry Cherry Jam and Garlic Dill Pickled Asparagus. Both are wonderfully delicious! We are open 9-6 Mon-Sat. Our market phone is 231-873-7523 if you would like to check on availability of crops. Our “The Best” Sweet Corn is a couple of weeks (or so) away!